NEW YORK — When Josh Beckett walked off the Yankee Stadium mound last night, it was as it had been in too many of his starts against the Yankees lately in his career. He was exiting far too early for a pitcher of his stature and his stuff, marking the third time in four starts against New York this season that he had come one out shy of getting through the fifth inning. His ERA, already high, soared to an embarrassing 6.21. And it sent Beckett reeling back to the way it was earlier in the season, before his extended stay on the disabled list, when he was pitching poorly and searching for answers. He had looked better since returning from the DL, turning in three good performances and two consecutive wins. That was the Beckett who was needed by the Red Sox, especially against the Yankees, and especially on a day when the Rays lost again. 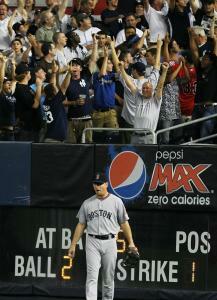 But Beckett had little in his 4 2/3 innings, giving up seven runs as the Sox fell, 7-2, to the Yankees. Not only did the loss prevent them from moving up against New York and Tampa Bay, but it also dropped them into a tie for second in the wild-card race with the rapidly charging Twins. It left the Sox in desperate need of a win today from Jon Lester to salvage a split of the series. So, three games into a 10-game road trip that Bill Hall had labeled the most important stretch of the season, the utilityman was asked where the team stands at this point. “We’re still right there,’’ Hall said. “Obviously today would have been a big game for us to win. Obviously tomorrow we need to go out and at least split this series and head to Toronto and continue to take care of business. Coming off perhaps his best start of the season, Beckett did not do nearly as well against the Yankees. Beckett, who entered with a career 5.95 ERA against the Yankees, allowed two runs in the second and five more in the fifth. Most of that was him. Still, he wasn’t helped by a defense that again betrayed its starter, though all of the runs were earned. The Sox had two errors, both of which contributed to runs. In the second, after Lance Berkman hit a double, Brett Gardner singled to Hall, who made a great stop and a bad throw, enabling Berkman to score. Gardner eventually scored on a two-out single by Derek Jeter. In the Yankees’ other big inning, the fifth, Kevin Cash added another error. With Robinson Cano on third, Cash had him picked off. But his throw bounced off Cano’s helmet and into left, bringing the second baseman home. In the end, though, it was Beckett, who was outpitched by Dustin Moseley, the fill-in for A.J. Burnett, who was scratched because of back spasms. Beckett followed the error by Cash by allowing the back-breaking hit of the night, a two-run double by Jeter. Mark Teixeira had led off the fifth with a homer, and then Beckett walked Alex Rodriguez, hit Cano with a pitch, gave up a double to Berkman, and walked Curtis Granderson. He struck out Gardner, but then Cash made his errant throw, three runs were in, and Jeter was up with two outs. The Yankee captain’s double marked the end for Beckett, who has yet to work more than 5 1/3 innings in any of his four starts against New York this season.